Mocha Torte (and Chocolate Sauce) | And Such Small Portions! 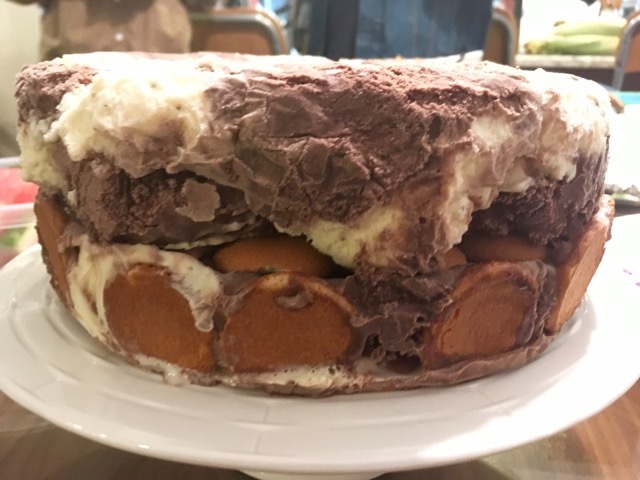 It wasn’t until I moved to New York that I learned people here have an entirely different conception of ice cream cake—that it’s not necessarily cake topped with a layer of ice cream, as the name would imply, but simply layers of ice cream in the shape of a cake (or maybe in the shape of a whale), separated by nubby little crunchy thingies that resembled nothing more than chocolate-flavored dirt. But like, good dirt. 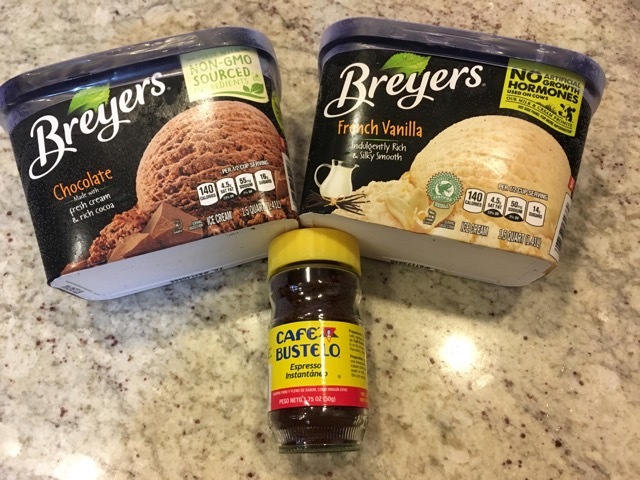 Then again: why bother getting bogged down in definitions when we could be eating ice cream that’s been scooped onto a bed of Nilla Wafters, whimsically swirled together, sliced into cute little triangles, and topped with homemade hot fudge? There’s a time for pedantry—but not when this is on the menu. 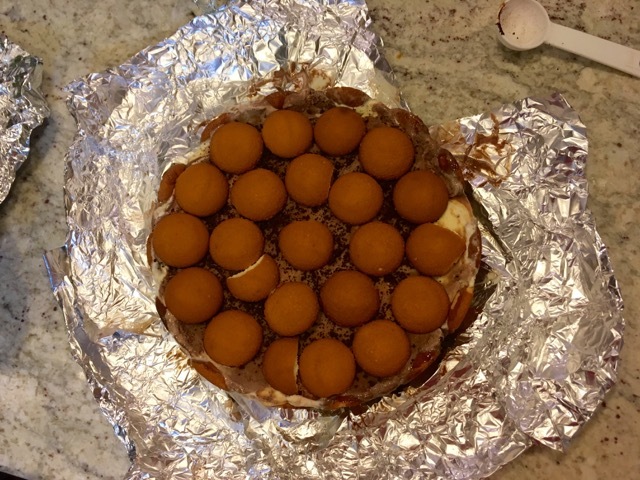 Line two 8″ round cake pans with tinfoil. 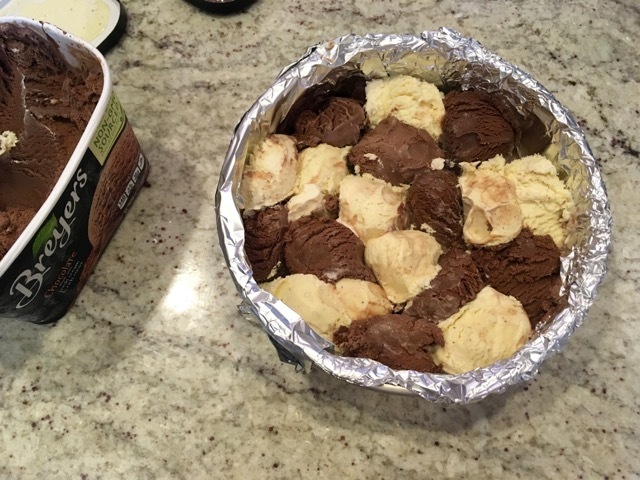 Fill one pan with ice cream balls, using a large scoop, alternating the two flavors. [You could dip your scoop into water in between each flavor to keep the colors from running together, but I couldn’t be bothered. 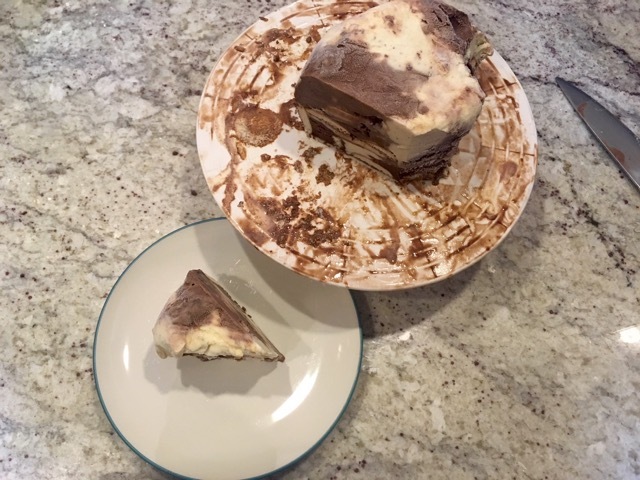 For me, this first step used up most of the ice cream in my big boxes; that could have also been because I packed the pan a bit to make sure it was completely filled with ice cream, not realizing initially that Nonnie wanted the other layer to be the torte’s flat base.] Freeze. Line second pan with vanilla wafers, using 14 on bottom and 10 around sides. [Maybe it’s because my cake pans were 9″ rather than 8″, but I needed way more wafers than this to cover both the bottom and the sides. I also wasn’t sure if Nonnie wanted them bottom side down or bottom side up; I went with down, so the bottom would be flatter.] 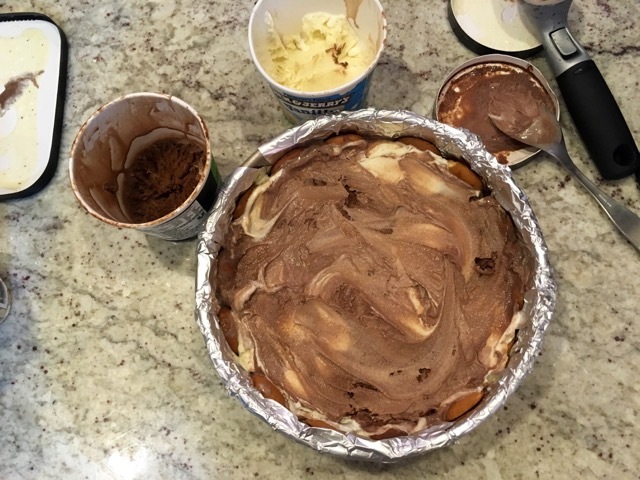 Fill pan with remaining ice cream, alternating spoonfuls of both flavors to give a marbled effect. Pack down to level. Freeze. Heat chocolate and cream together, over low heat, until chocolate melts. Remove from heat. Stir in vanilla. Makes 1 cup and can be stored in refrigerator. 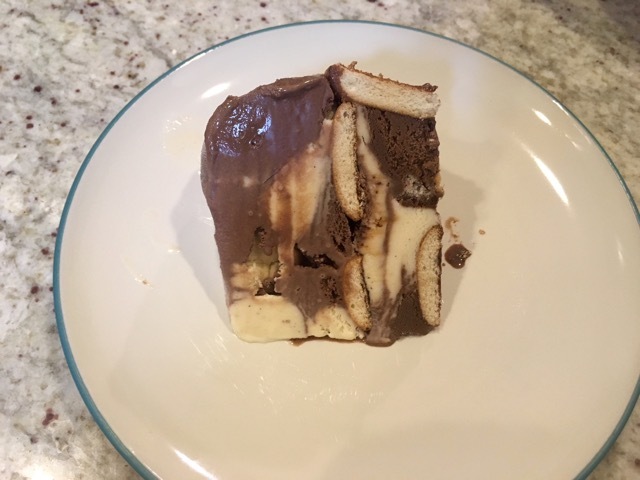 The verdict: I felt a little silly presenting the mocha torte as a dessert I’d “made,” since really, all I’d done was take ice cream and put it in a different shape. 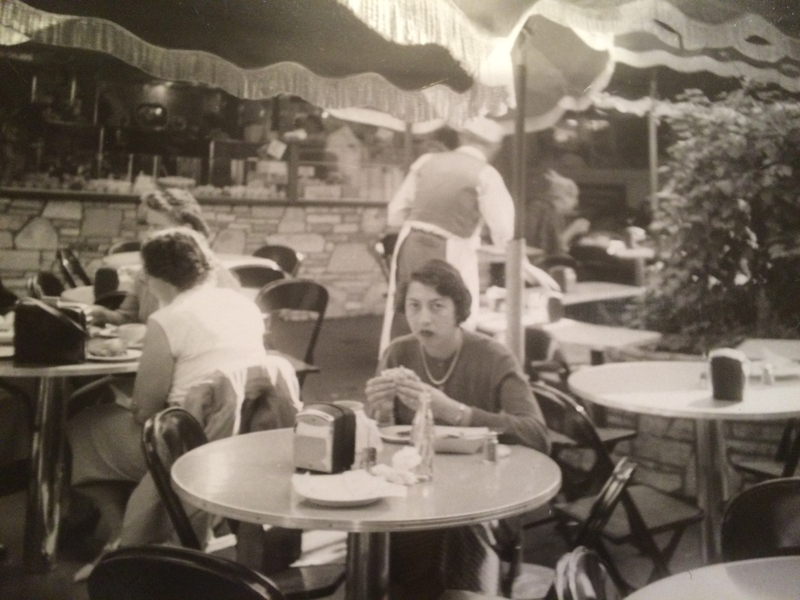 As it turns out, though, nobody cared that I’d used Breyer’s instead of house-churned vanilla bean gelato, or Nilla wafers instead of hand-crumbled artisanal crunchies. 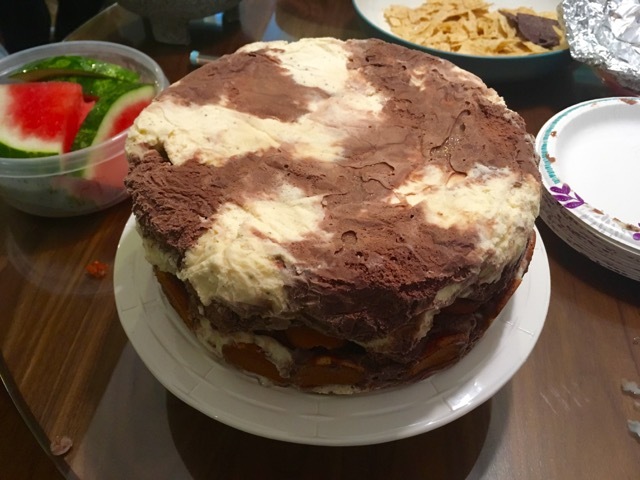 People like ice cream cake, and the mere act of “making” one is impressive, probably because people generally think of this as a treat that’s always purchased from a store—which means that in terms of actual vs. perceived effort, Nonnie’s mocha torte is one of the greatest bang-for-your buck confections out there. Though a little bit of melting does wonder for the texture of bad Nilla wafers, it of course also makes a whole lot of mess—so next time, I’d serve this in some kind of dish with a lip rather than a flat cake stand. 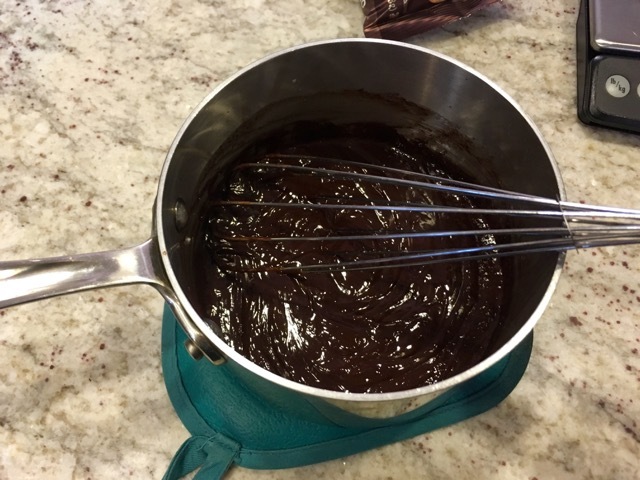 I’d also experiment with using more espresso powder, which adds a nice counterpoint to the sweetness of everything else; maybe I’d swirl it into the ice cream itself. Beyond those tiny tweaks, though, the mocha torte can’t really be improved upon—even if, as I maintain, it isn’t really a cake.